It’s one of those rainy days where you’re cozed up in the cabin, in need of comfort food and a good book. And there happen to be four over-ripe bananas hanging in your galley. Stop. WAIT!! Did you say bananas?? Are you crazy? 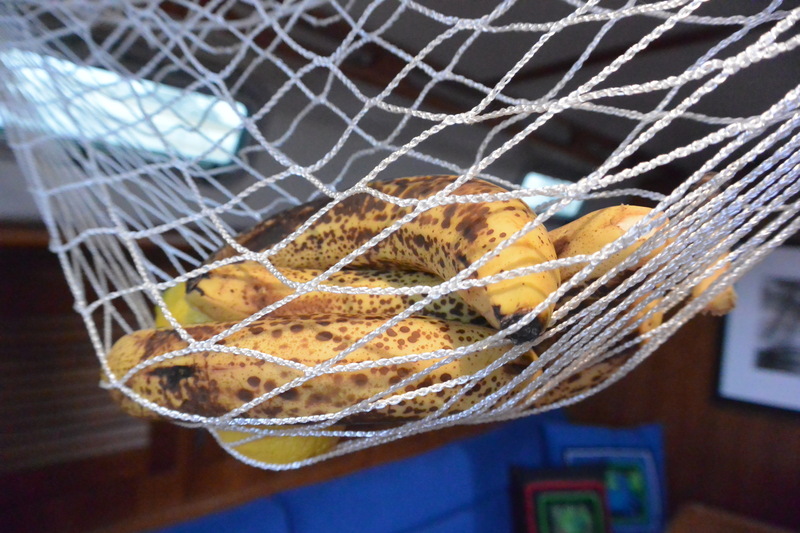 Every sailor knows that bananas on board a vessel are bad news; BAD LUCK. Don’t go there. But then I got curious; thought I’d ask other cruising sailors. The response from one avid cruiser: “We’ve cruised for years and always kept bananas on board.” So that was all the validation I needed. Hmm. But come to think of it, they have been struck by lightening. Twice. 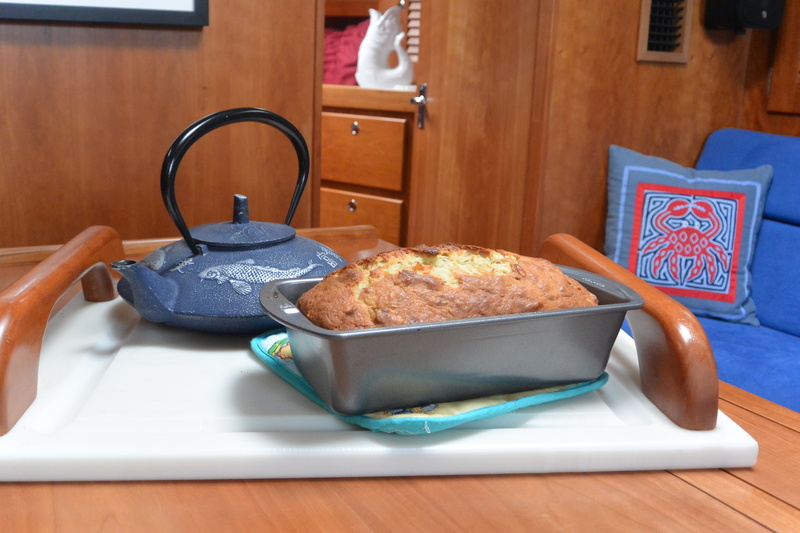 My favorite Banana Bread recipe comes from an old Joy of Cooking, no longer published. We Galley Pirates, of course, give it a piratey twist. Place an insulated cookie sheet in your galley oven and preheat to slightly over 350. In a large bowl, blend shortening, sugar and lemon rind until creamy. 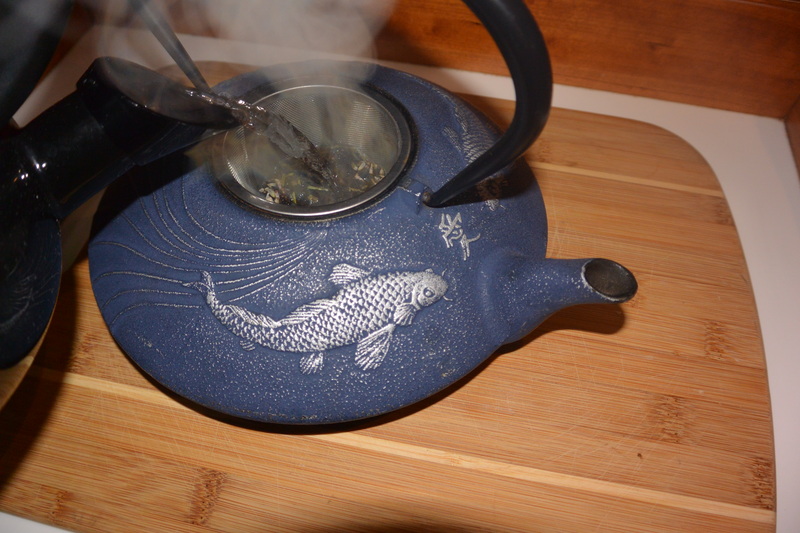 Mix together (or sift– but who sifts any more?) flour, baking powder and salt in a separate bowl. Add the dry ingredients to the shortening and sugar mixture. Beat the batter until smooth. Mash your bananas. Beat in eggs and bananas. 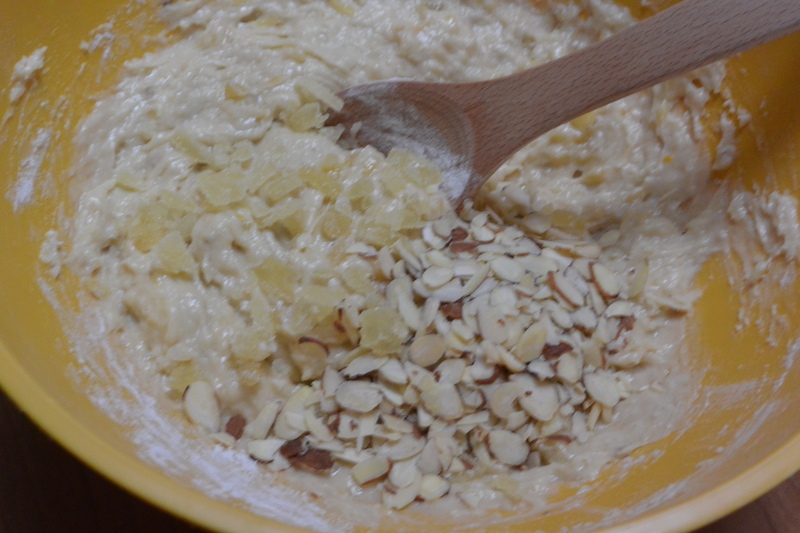 Fold in almonds and crystalized ginger. 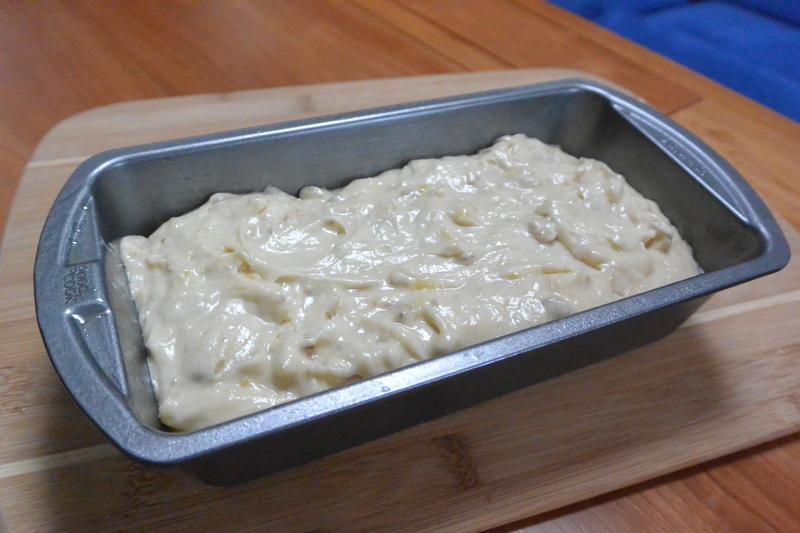 Place the batter in a greased 8.5 x 4.5 loaf pan. Place the loaf pan on the cookie sheet in your preheated oven. Bake for one hour or until a a knife inserted comes out clean. All done. Cool a bit before slicing. Ahh. 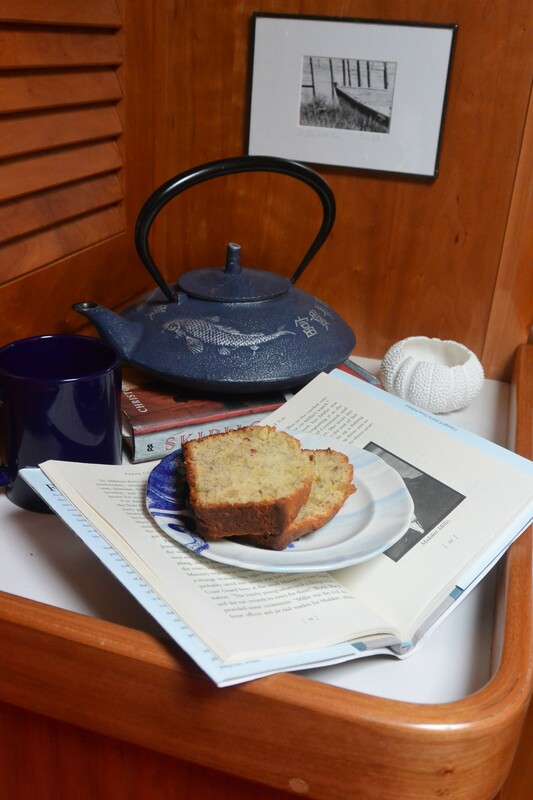 Grab your warm banana bread slices and curl up in the V-berth with a good book and hot tea. Let the rain patter on the deck all day (with an ear out for leaking hatches). Thanks for joining us on this rainy day. Would love to hear from you! Share your favorite rainy day recipes on Galley Pirates. Fair winds and blue skies. Banana secret: if you wrap some handy wrap around the stem of a bunch of bananas…they will stay ripe for abt five days, no brown spots! Simply amazing. When you do this, you are stopping the gases that come from the stem. Sweet! Wow! I didn’t know this trick! I’ll be sure to try that. Because I live on the edge and DARE to have bananas onboard!